It’s a well-established rule that if you’re going to produce a major blockbuster, then you absolutely must merchandise the hell out of it. There’s still four months until Batman V Superman: Dawn of Justice hits theaters, but that doesn’t mean it’s too early for Warner Bros. to start peddling merchandise. That being said, if you like your shirts to be a bit more minimalist, there are ones for sale that merely have the Batman V Superman logo on the front. There’s something for everyone here. The shirts that focus on Batman paint him as a demon, which seems to fit with the notion that Ben Affleck’s Batman will be an elemental, almost mythical source of fear to the general public. Superman’s shirts seem to emphasize the idea of xenophobia surrounding Kal-El’s presence on Earth – which has also been heavily alluded to in the trailers. While the shirts most certainly inform us about the nature and thematic elements of the film, they don’t seem to give enough away spoilers. We know that several other members of the Justice League will be appearing in the film, but the nature of their appearances remains a mystery – with no shirts or merchandise released to give away their role. However, this does also raise some questions as to why no Wonder Woman merchandise has been announced yet, as she also features prominently in the film. A similar problem occurred along with the release of Avengers: Age of Ultron, in which actor Mark Ruffalo noted that there was little to no merchandise released for female Avenger Black Widow. We won’t go so far as to level accusations of misogyny, it just seems odd considering a pivotal member of the DC trinity has received so little recognition in what's sure to be a full force merchandising machine. 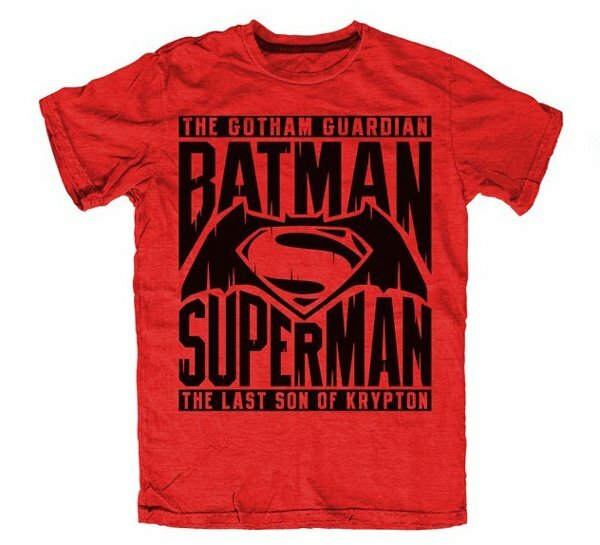 We will keep you posted on any and all news related to Batman V Superman: Dawn of Justice, but until then you can preorder one of these shirts to keep your style game on point.